TV Series, Episodic and Tutorial content on Steam provides a unique opportunity to sell content to a worldwide audience who are deeply engaged in the ecosystem that is Steam. You can sell your content at a Series level, at a Season level (purchase all at once or Complete My Season), individual episodes or even bundles with games or software. Series support also allows for free content, whether the whole series or just a couple of episodes as an introduction. Series receive the same level of promotion an individual film or other standalone piece of content receives on Steam including major sales, weekend and daily deals, etc. Customers can wish list and follow a Series, earn trading cards, show off their interest on their profile and talk about the content on discussion forums. Just about everything a game can do on Steam, a Series can do too. Below are step-by-step instructions for bringing your episodic content to Steam as well as more details about how this new content type on Steam works. If you have any other questions, please post in the developer discussion forum and we'll be happy to share more! Submit a ticket and provide a description of the video content you'd like to distribute and a new video series app will be created for you. The Series App represents the Store Page that will be on the Steam Store, the Community Hub, what Steam users see on their profile, the product they can wish list, etc. All actions whether buying an season, watching a single episode, etc., are rolled up and attributed to the Series. The Series app is also the place you will go to create and manage the Seasons and Episodes, the Series package, the Season Bundles, etc. It is also the place where you must complete the Release Checklist to be able to release the Series. The Store or CD Key package is the package that will be sold on the Steam Store. You will need to price this package before it is available for purchase on the store. The Beta Testing package is the package you can use if you want other people to have access to the content before the Series is released on Steam. Please review the Product Key documentation for more information. The Developer Comp package is the package that any Steam user who is part of your Steamworks partner account will receive automatically. As Seasons and Episodes are created, all three of these packages will automatically update to include the new videos. Once the Series App has been created you should be able to find it in your All Applications page. Clicking on it will take you to the Series App Landing page where you can find all the regular Steamworks App features (Edit Store Page, Packages, etc.). For Series content you will find a new entry called Manage Series. Clicking that will take you into the Series tab in the Steamworks Settings section. The first time you visit the Manage Series tab it will contain no Seasons and no Episodes. 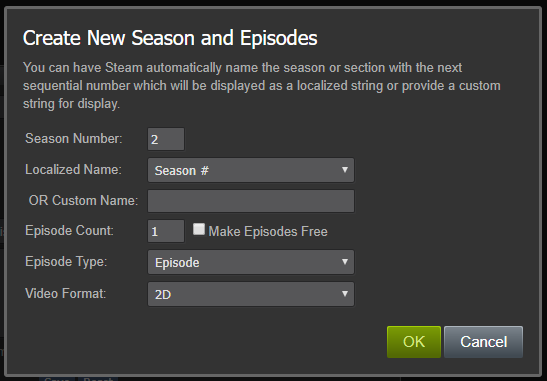 To begin adding Seasons and Episodes, click the Create New... button. Season Number: A Season must have an associated number between 1 and 99. By default, the next sequential number in the list of seasons will be set. You can choose to modify the number if you are creating seasons out of sequential order. An error will occur if you attempt to create a season using an existing season number. If you need to add episodes to an existing season, use the Add Episodes to Season button. Localized Name: Every Season has a name. It could be as simple as "Season 1" or it could be something unique such as "The International 2016". If you want to take advantage of localized descriptions select a name from the dropdown box. The # shown in the dropdown box represents the Season Number as set above. If you want a custom season name, just type it into the box next to OR Custom Name. Episode Count: Every Season must also contain some number of episodes. It's helpful if you know how many episodes a season will contain before you create the season. If you have a rough idea, then create more than you will need (you don't have to release any episodes that don't end up existing). If you need to add episodes to the season at a later time, use the Add Episodes to Season button. Make Episodes Free: If you want to make all your episodes free, use the checkbox next to the Episode Count. If you are thinking about making one or a few episodes for free, then don't check the box. You can change your priced episodes to free as needed but going back from free to priced is a bit more work for everyone. Episode Type: Lastly you can set the type of Episodes you want to create. The type of an episode changes the way it is displayed on the store and in the library. The type of episode can be changed after creation so set the value that is appropriate for the majority of the season. EPISODE: Will appear with the Episode Number and Name along with the original release date. CHAPTER: Will appear with the Chapter Number and Name but no original release date will be collected or displayed. BONUS CONTENT: Will appear without the Episode number or original release date. BEHIND THE SCENES and DELETED CONTENT: Will appear without an Episode number or original release date. The intended use of these two types are to categorize the content in a future revision of the Steam Library. Video Format: Traditional flat / 2D content or 360° Open Project Format can be selected. Click OK and the Episodes will be created. Once complete the page will refresh and you will be presented with the new episode content. During the Episode creation process, an Episode App is created for each episode requested. Just like a Series App, this Episode app is the thing customers receive when they buy the episode either individually, through Season Bundles or the Series. For each episode you will need to submit episode metadata, ingest the video file, set up subtitles and set the pricing. However, the majority of that can be completed through the Manage Series tab and the platform will do a lot of the work for you. During Episode creation three packages are created, each containing just the Episode App. It's unlikely you will ever need to adjust the contents of these individual episode packages. The Store or CD Key package will be the one that is priced for sale. For each Episode that you create, there is a small set of data that needs to be entered so that the episode is shown correctly on the Steam Store. Header Capsule Image: Unlike the Series App (and any other app on Steam), you only need to provide the Header Capsule image. If you don't provide an image, the Store will automatically use the appropriate image from the Series. It doesn't look as good but we also understand that not every episode, chapter or piece of bonus content will have art. If you have the capsule art, click the Choose File button or drag the image onto the file selector. When you click the Save button, the image will upload and a preview will be shown to you. Number: If desired, you can set a different number to appear on the store page (and soon, the Steam Library view) for the episode number. By default, the number will match the episode index unless you reorder the episodes. Name: Give the episode a name. You don't need to put the Series name in the title, Steam will do that automatically for you as needed. Episode Type: If you need to adjust some of the episodes to a different type, you can do that here. Original Release Date: Enter the original release or broadcast airing date of the content. If the content is in the future, just set the best guess date you have. The original release date will not be available for non-episode type content. Running Time: Enter the length of time in minutes. Round down for less than :30, round up for greater the :30. Description: The description should be a short summary of the episode content (maximum of 300 characters). The text box size is approximately the amount of content that will show up on the Steam Store. If you have description in other languages, select the appropriate language from the drop down. Hide Name, Description and Running Time: If you are releasing a Season Pass (using the Season Bundle), episodes must be in Pre-Purchase for a customer to buy them in the Bundle. If the future episode name, description and running time need to be hidden from customers until release, turn on this checkbox before the episode is put into Pre-Purchase. When you're ready to release the episode, turn off this checkbox to enable the details to be shown to customers. Click Save to commit all the changes. This will update the underlying Episode App automatically (Store Page, Settings, Package names, etc.). Click Reset if you've made a horrible mistake and want to reset the episode to the currently saved values. Now repeat for each episode and you'll have the metadata entered for all the episodes in a season! If you are more comfortable with using Excel to prepare your data, there is an option to Export and Import the Episode metadata for the Series via a CSV file. Click the Import Metadata link and the Import / Export Dialog will appear. Download either the Series or selected Season metadata. Open the downloaded CSV file in your favorite editor such as Excel. The CSV contains the Episode ID, Season and Episode Number and all the fields described above in the Episode Metadata section. Modify the CSV to set the correct data and when done Save and Close the file. Season and Episode Numbers must use Seasons and Episodes that are already created. Episode Names should be limited to 64 characters. The Episode Type values allowed are episode, chapter, bonus, bts ("Behind The Scenes") and deleted. Invalid Original Release Dates will be reset to the time of import. Running Time should be between 1 and 9999 minutes. Please ensure you provide an English description along with any other localized descriptions. From the Import / Export Dialog, click Choose File and select the file you just edited. The CSV data will be processed and if no errors occur the page will reload with the updated data. Note: You will still need to upload Header Capsule Images episode by episode. To change the order of the Episodes within a Season, click the 4 horizontal lines near the Episode number indicator and drag the episode to the new location. The Episode number indicator will continue to show the original episode number until the page is refreshed. If you need to add episodes to a season after the initial Create New Season process, you can click the Add Episodes to Season button below the list of existing episodes. Similar to Create New Season, you can set the number of episodes to add, if they should be free and the type of episode to be created. 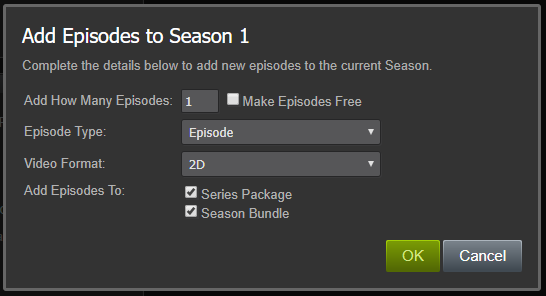 In addition, you can selectively choose to add the new episodes to the Series package and the associated Season Bundle. If the Season Bundle is already live and for sale, you will not be able to automatically add the new episodes to the Bundle. Please contact the Steam Business team to discuss options for adding episodes after a Season Bundle is live. Click the Set Price link shown next to the Episode metadata. A window will pop open that allows you to set the price for the episode. You can also change the episode to Free in that window. Click the Price Episodes link. A window will pop open to the Bulk Pricing tool filtered to the name of the Series which should show all the episodes for a Series. Set the price for each episode and submit the pricing changes. Review our Pricing Best Practices for additional information. Note: If an Episode should only be available as part of a Series (such as Tutorial) you do not need to set a price on the episode. Each episode needs a video file uploaded for ingestion into the video platform. This is the same ingestion process used for films and standalone video content. Click the Upload Video link shown next to the Episode metadata. A window will pop open to the Video Upload tab for the Episode. Click the Subtitles, Captions, Languages link shown next to the episode metadata. A window will pop open to the Video Management tab for the episode. Once an episode has metadata, pricing and the associated video file ingested, it is ready to be released. You will know it's ready to be released by looking at the Checklist state next to the episode metadata. Once all the items are completed the Checklist state will update accordingly. If you believe you've completed all the steps but the Checklist remains as Not Done, click the Video Landing Page link next to the episode metadata. That will pop open a window to the Episode App landing page and you can review the checklist on the right-side to determine what isn't completed. Once you're ready to release one or more episodes, click the Release Episodes link for the Season. Each episode within the current Season that is checklist complete (but isn't already released) will be shown in the Release Episodes dialog. Select the set of episodes you want to release using the checkboxes next to each episode name. COMING SOON: This will set the episode into pre-purchase mode using the Original Release Date of the episode. You should only use this option if you are selling content before it's available. RELEASED: This will set the episode into the released state so that owners of the episode are able to watch it. If the episode should be sold or be available independently of the Series or Season, check the Make individual episodes available for purchase checkbox. This will publish the Episode Package to make it available to the Steam Store. Click OK to begin the release process. The dialog will indicate which episode it is publishing and any errors that occur during publishing. This step will take about 1 minute per episode being released so please be patient. The final stage of getting an episode to appear on the Steam Store is to make sure the Series App is released. You can release the Series either before or after the first episode is published and only needs to be completed once. To release the Series App, you first need to complete the Release Checklist as displayed on the Series App landing page. Once the checklist has been completed, submit the Series App for Review. Please allow a few days for the review to be completed. Once approved you can set the Series into either Coming Soon or a Release state, just like with the episodes. 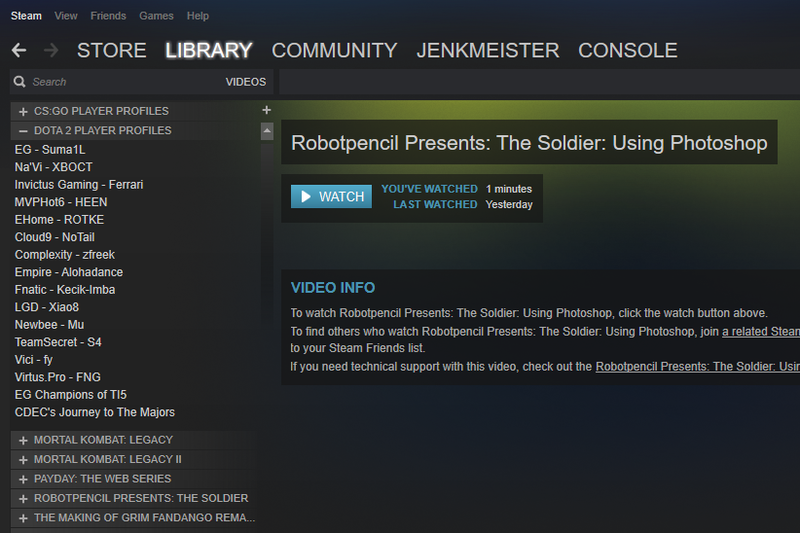 Pre-Purchasing an entire Series is supported but requires the Steam Business team to complete the setup. Once the Series App is released, the Store page will be available and any episodes published will be shown on the store page for purchase. At the same time the Community Hub will be created, the Series can appear on users profiles, etc. When a season is created, a Season Bundle is also created and all the episodes for the season are added to the bundle. The bundle is configured as a Complete the Set so that customers can purchase the Season whether they own none or some of the episodes in the Season. Because of this configuration option, it is strongly advised to not adjust the content in a Bundle after it is released. If you have a scenario that requires modifying Bundle content after it is available for purchase, please contact the Steam Business team. To configure a Season bundle, click the Season Bundle link. A window will pop open to the Bundle configuration page. Documentation on Bundles can be found here. To incentivize customers to complete a season, you may wish to set a discount on the bundle. The discount is applied to the sum price of all the episodes in the bundle. Set the Bundle description if there is more information about the Season a customer should know. If you want the Bundle to appear in the Steam Store search results or in other lists such as "New and Trending", then you will need to upload the required graphical assets for the bundle and publish the changes. If you want to release the Season Bundle for purchase, use the Set Live button to launch the Bundle. You should wait to release the bundle until all episodes for that season are released or in pre-purchase. A Season bundle will show up within the associated Season tab on the Store page. The Series Store page will display each of the Seasons and each of the episodes within the Season. The order is based upon the episodes as they are ordered in the season. If an episode is available to be purchased individually the price and "Add to Cart" button will be shown. If a Season bundle is available that will be shown above the episodes for the season. The series package will be shown at the top of all the purchase options if that is made available. Series appear in the Videos section of the Steam Client Library. Series are automatically grouped and categorized based on the Series name. The order of the episodes is maintained in the library. A customer can then select any individual episode to watch. Later in the year, there is work planned to present the content in the library grouped by Season and Bonus content, etc. There won't be any additional work required to take advantage of this updated library experience. The Series and Episodic Platform will continue to evolve through as more content is launched and new scenarios need to be supported. Below are some other things to keep in mind during this development period. Trading cards can be configured for a Series in the same way as for a film or a game. The playtime required for trading cards to drop is accumulated across watching any episodes in a Series. Please see the Trading Card documentation for more information. Note: Trading cards will only be earned by a user who purchases the Series package, not with Season by Season or Episode by Episode purchases. We will address this in a future update to Series Trading Cards. If you need to move an existing episode between seasons, please contact the Steam Business team to assist. Once an episode has been released, you are free to update the metadata, replace the video file, update pricing as appropriate. Please be aware that clicking Save on an episode will cause that change to publish immediately and will take more time than saving episode metadata before release. If you choose to use the Import Metadata tool on content that has been released you may wish to wander off and get a coffee while the data is updated and all the changes publish out. If your Episodic content requires country restrictions, please contact the Steam Business team to have those restrictions set before launching the Series. When episodes are released, the country restrictions are automatically applied from the Series settings. A Community Hub and Discussion forum is automatically created when a Series is released. If you wish to create sub-forums for each Season you can do that in the Discussion Forum admin tools. Please see the Associated Software Files topic for more information. When a customer looks in their Steam Library, they will find the content of Series automatically categorized and sorted in Season and Episode order. They can then play any video from the Library in any order. If a customer plays an episode, the next episode in the Series will be shown on the Play Next button in the video player. Future options may include custom playlists and resuming Series playback automatically. When a user has watched at least 5 minutes of an Episode, they can write a review for it. That review is rolled up and is visible on the Series Store page and in the Community Hub for the Series. Likewise playtime (or watch time) is rolled up to the Series App for display on the users profile. Individual episode activity is not shown on the profile. A Series will show up in the Financial Stats site along with each individual Episode. You can see total sales across a Series along with total users watching the Series. If you look at the Bundles section, you can see sales for season bundles.